More press about Edgewater lighthouses Reviewed by Edgeville Buzz on August 27, 2010 . 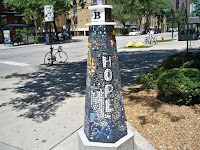 CHICAGO – It’s hard not to notice the fanciful lighthouses adorning the streets of one lakefront neighborhood that’s home to many GLBT Chicagoans. The lovely lighthouses peppered throughout the streets of Edgewater not only symbolize a neighborhood’s dedication to its residents but also a monumental community effort. In celebration of its golden anniversary, Edgewater Community Council created 20 handmade wooden lighthouses, all of which were uniquely decorated and displayed by local individuals and businesses. ECC 50th anniversary committee co-chair and former 48th Ward Ald. Marion Volini said ECC wanted to find a symbol for the decades of vital improvements the organization has been able to make. Because of Edgewater’s lakefront setting and its unwavering commitment to improving the neighborhood, helping its residents and taking a stand on important issues, many felt that a lighthouse, coupled with the theme “Lighting the way for 50 years,” was especially fitting. “We think of Edgewater as a safe harbor because we’ve been a port of entry for so many different groups of people over the years,” Volini said.